in the long bones of dinosaurs. 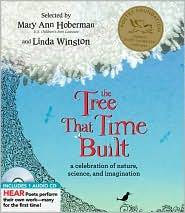 Before Poetry Month is gone again, this is a good time to take a look at a significant new anthology, The Tree That Time Built: A Celebration of Nature, Science, and Imagination (Jabberwocky, 2009), which unites a remarkable collection of poems--old and new, short and long, funny and profound--all focused broadly on nature science. Editors Mary Ann Hoberman and Linda Winston have brought together a diverse selection of poems by a wide variety of authors, from earlier centuries (Emily Dickinson, Walt Whitman, and William Blake) and from renowned "modern" poets (Carl Sandburg, Robert Frost, Theodore Roethke, D. H. Lawrence), as well as children's poets such as Jack Prelutsky, Lilian Moore, Alice Schertle, and Hoberman herself. The nine chapter headings are drawn from famous titles--"The Sea Is Our Mother," "Meditation on a Tortoise," and "Everything That Lives Wants to Be Free" for example. Appended are extensive notes, information on poetic forms and vocabulary, and suggestions for use of the book in the classroom. A special CD of well-known poets reading their own works and other specialized readings is included with this attractively designed book--an outstanding first choice for any school, public, or home library--even when April is past. How great that a CD of the poems is included alongside the text. I keep meaning to track this book down, I like the sound of it so much. Order it here! One click!